Pinnacle has the opportunity to work with many real estate and investment companies that have multiple properties across the county. 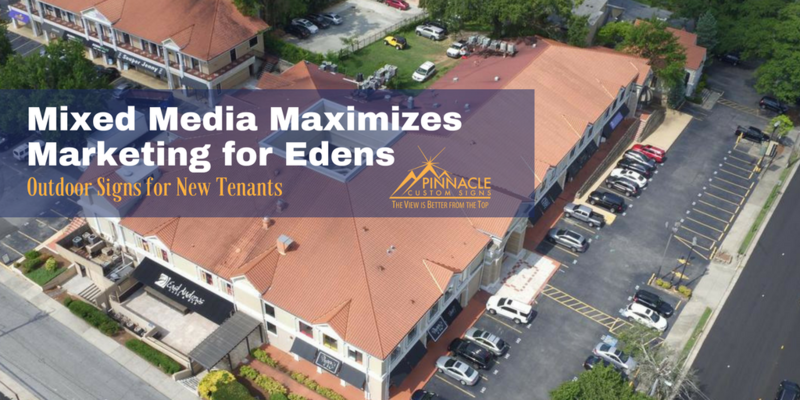 One of the companies that we have recently been asked to assist in specific tenant improvements is for the Edens Property Management regional office based out of Atlanta. Edens develops, owns and operates community-oriented shopping places in primary markets across the country. 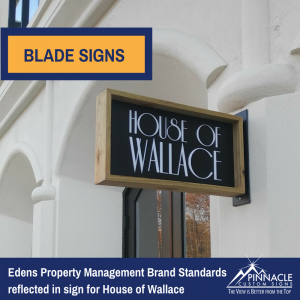 One of their retail locations is Andrew’s Square in Buckhead that was welcoming two new retail tenants who needed to be able to brand their locations while adhering to Eden’s specific standards and requirements for tenant occupants in regards to signage. This is where Pinnacle stepped into to be the middle man between the parties. The first of the two stores was La Green. La Green is a retail boutique located in Buckhead, GA. This location needed several types of signs to capture the branding their location needed for such a heavily traveled corridor. We started by creating backlit Channel Letters with 2” returns to showcase the store to those on the street and highlight the brand after hours. We added a wood framed blade sign with laser cut acrylic in order to brand the store to the heavy foot traffic that this sidewalk receives in such a populated shopping area. 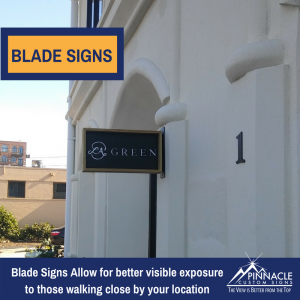 The blade sign allows foot traffic to identify the location before arrival without having to look at the location head on like the backlit channel letters. Finally, we added vinyl to the door to brand the entry way and provide basic hours of operation and online shopping opportunities for after hour traffic. All of these outdoor sign options were able to meet both the brand standards of the company as well as the landlord’s specific building requirements. The second location at the Eden’s property which needed fabrication and installation was the House of Wallace. This was the first brick and mortar location for the popular California based online fashion provider. Therefore, outdoor signage standards had to be determined to correlate with the company’s online branding. Pinnacle started by once again installing backlit outdoor signage but in this case, we opted for Stainless Steel Letters with 2” returns to comply with the landlord’s occupant standards. The sign was enhanced by adding custom paint, a 3-dimensional border and hand painting the background with the company’s logo to incorporate their unique style and mission into the signage. Then we created and installed the wood framed blade signs with laser cut acrylic to optimize their foot traffic into the store as well. The House of Wallace was also completed by adding their logo and basic information to the front door with vinyl. In both cases the overall concept was the same: outer wall visibility from road traffic, outer wall visibility from foot traffic and door branding. However, the process to get to the final project was a bit more difficult. La Green had experienced signage choices in their other retail boutiques prior to the Andrew’s Square location in Buckhead, House of Wallace had not. Also, even though the final products look very similar — the difference in company brand standards and material selections were very different. 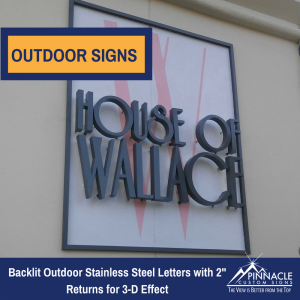 Since Edens Property requires 2” returns on the outdoor signage, House of Wallace had to opt for stainless steel fabrication due to the thickness of their logo. La Green could easily go with traditional channel letters because their branding was so different. Both stores have property blade signs with the same specifications and dimensions, but the logos offset the signs being identical. 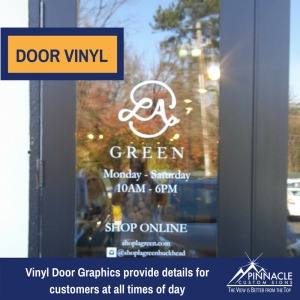 Finally, the door vinyl used for both locations helps to provide customers with brand and location recognition for anyone who stumbles across the boutiques after hours. Although we don’t always like being stuck in the middle, we do serve clients across the United States that need to satisfy their property owners while also sticking to their business brand standards. From retail shopping locations, commercial office complexes, and industrial centers — we are often called to find compromise between business branding and covenant requirements. If you have an outdoor signage need that requires balance between two parties then give us a call for free quote or complimentary consultation. We would love to be stuck in the middle with you!